Jonathan Frey gazes down at his open hand, then looks up. Frey was in his first couple of months as William & Mary’s new makerspace director. Makerspace users apply their thumbs to more than spacebars, but Frey says the tools — even the coolest of tools — are just the starting point. Frey’s goal is to turn the thumb amplifiers up to 11 by expanding and consolidating the William & Mary makerspace environment. He says he wants to attract all members of the university community to a makerspace in which all the cool, thumb-amplifying tools are available in a safe, enticing setting. And he wants the magic to happen in one room. “The ideal makerspace? Imagine something that combines an old-time machine shop with a Starbucks,” he said. The Starbucks part would be a safe, comfortable space from which people can learn tools and techniques of additive and subtractive manufacturing. Frey says he spends a lot of time thinking about the necessary space for an ideal — or at least near-ideal — makerspace here at William & Mary. He is making his case for the space in the ongoing design discussions for the fourth phase of the university’s Integrated Science Center. He said the consolidation is a priority because the current makerspace environment is fragmented. Two members of the Department of Physics, Wouter Deconinck and Joshua Erlich, acted as volunteer coordinators of the Small Hall Makerspace, which long ago outgrew its original home in a single lab space on the first floor of the physics building to accommodate the addition of computing, electronic and rapid prototyping tools to the environment. Small Hall doesn’t have the only makerspace at William & Mary. The School of Education and the Mason School of Business have joined the makerspace movement, as has Swem Library. 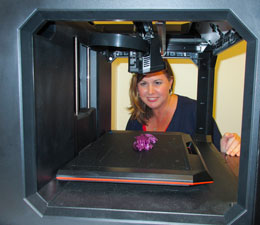 Lisa Nickel, associate dean of research & public services at Swem, coordinates the library’s makerspace activities. She said she looks forward to Frey’s involvement with users at Swem. The makerspace expansion is just one facet of William & Mary’s growing program in engineering. A new engineering physics and applied design (EPAD) track for physics majors will enroll its first students in the fall. A minor and self-designed major in data science has exceeded enrollment expectations. And Frey, with an academic base in the university’s Department of Applied Science, will begin teaching a new makerspace-based Introduction to Engineering course to William & Mary undergraduates in the fall. The goal, he said, is to give the students the wherewithal to translate their ideas into the material world. The technical knowledge will expand through a “tool steward” program: Frey will teach a person how to operate, for instance, the iSense 3D scanner. That person could then become a tool steward for the instrument, teaching others how to use the scanner. Frey says the makerspace concept is perfectly congruent with William & Mary’s liberal arts philosophy. He holds bachelor’s and master’s degrees in electrical engineering and is the owner and operator of Build, RVA, a commercial makerspace community in Richmond. And he sees no conflict between engineering and the liberal arts. The role of the makerspace is “to keep up with the advancing frontier,” says Dennis Manos, vice provost for research at William & Mary. He gave the example of semiconductor manufacturing, which has been using an iterative deposit-pattern-etch process to build a chip in layers. He explained that the advancing frontier has extended the availability of sophisticated manufacturing instruments. “Additive manufacturing, what semiconductor people have been doing for 40 years, is now all the rage in manufacturing macroscopic objects that you can see,” Manos said, instancing 3-D printing, laser-assisted deposition and compactification of sintered materials. Under Frey’s guidance, the makerspace will allow members of the William & Mary community to amplify their thumbs in order to take on large and ambitious projects, although he also takes seriously work at the other end of the complexity spectrum: Frey cites crocheting as a “method of manufacturing.” But a projects list on the makerspace whiteboard lists a “self-driving car,” and he says that even Dr. Evil’s holy-grail makerspace request is not beyond the realm of possibility. A walk through the Small Hall Makerspace during a 2015 open-house event.